I am up to 1-1/4 inches in length. I can have grey, black, or a brown body and my two wings are generally dark colored. 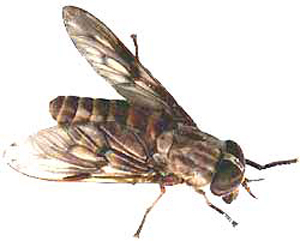 I resemble a housefly, but am larger and have short horn shaped antennae. As a larva, I eat other insects, worms, snails and occasionally a small fish. If I am an adult female, I will drink the blood of large animals and humans. If I am a male adult, I will only drink nectar from flowers or juices from fruit. I am generally found near areas that contain water and also close to livestock areas, which is a food source. I go through four stages of development: egg, larva, pupa and adult. My egg is laid on plants in or near water. Once I hatch, as a larva I will spend one to two years growing in moist soil or water. As an adult, I only live for a few days.